She is a star of the Aspiring Writers' Community at SHEROES. She is a voracious reader, in fact, she is a fan of the late, great Harivansh Rai Bachchan! She belongs to a small town Lambhua at Sultanpur in Uttar Pradesh, where she says a girl's basic education is a big deal. But unfazed by the society she lives in, she is a published author of three books! And she is just 19! 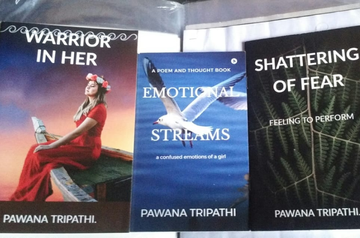 Meet Pawana Tripathi, the young author of three books namely EMOTIONAL STREAM, SHATTERING OF FEAR and WARRIOR IN HER. “Emotional Stream deals with the thoughts and poetry related to the day-to-day emotions of a human being. 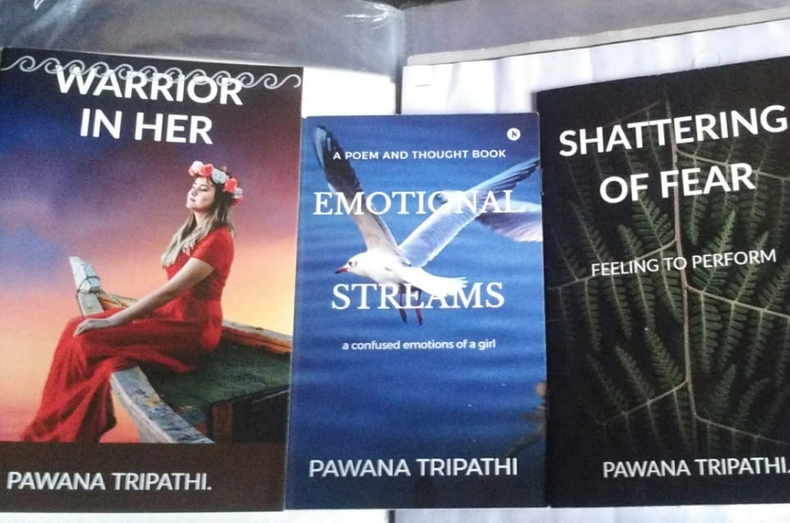 Shattering of Fear deals with the overcoming of fear in life that put a barrier in our ambition, and Warrior in Her is celebrating the fact that women can handle anything they have enough courage and bravery," Pawana details all in one single breath! I couldn’t help, but wonder how she managed to achieve all this at a tender age? The storyteller in Pawana kick-starts and when a storyteller speaks, it is better not to break the flow! So here goes Pawana, "Ma'am, let me start from the basics of my life. I am one of the twins (have a brother) born to middle-class parents. Lambhau is a very small town in Sultanpur, UP. It not only lacks basic resources but also in basic information and education. Here it is kind of impossible for a girl to realise her full potential; rather she is preferred to be married off just after basic schooling. But my parents are providing me the best of education. I go to the main town, Sultanpur for College. Papa wants me to be an IAS officer, while Mummy wants me to be a doctor. So right now, I am in my first year of college, where I am studying Medical Microbiology." Talking about her writings-streak, she goes on to add, "I wrote my first poem when I was in class five. I got the 1st prize and my mother was quite upbeat about it. That's when I got to know that my mom and I share the same passion! She started getting me a lot of literature to read and my pen just got better with time. By the age of 17, I had a huge collection of self-penned poetry and other literature. During the same time, one of my teachers motivated me to become an author. Being in Sultanpur, it was unimaginable. While my family was finding ways and means to support my dream, they and I were facing a lot of negative comments. As you are aware whoever tries to break the barriers, is always discouraged by the society. My mother used to motivate me a lot those days, asserting to stay focused. With few friends and teachers' help, I got to know about two-three publications, where I sent my manuscript online. None got rejected. And by the grace of God, today I have three books of my own in my hands." Checkout Pawana's take during the #BeYourOwnRANI Campaign on SHEROES. "My mother could never turn her passion into a profession. So these books are my tribute to her sacrifices for me. When my first book came out, my parents were thrilled beyond measure. That was really an epic moment!" Since then, she informs, she has been writing for a lot of Magazines, and other publications, both in HINDI and ENGLISH! No wonder she is an inspiration to many at the ASPIRING WRITERS' COMMUNITY at SHEROES. She laughs and asks, " Is it? You made my day! Let me dedicate something to all writers there: Writers are never off duty; Either they are writing or thinking what to write!" " I joined SHEROES in 2018 because I love the way women come out to support each other here. I simply adore SHEROES since it not only provided me the best sisters and guides in life but also gave me so many lessons in life. So many solutions in life. SHEROES is like a Doraemon to Nobita!" And we both laugh out loud. So Pawana, what's your message to all those who wish to excel, but are disheartened due to lack of resources? The 19-year-old asserts with great confidence, "Never lose hope because best is always yet to come. Never ignore your passion and don't be afraid of failure. Fear is nothing more than an internal give up. So do not fear. And if you are a writer like me, write every day and keep searching for opportunities. There is no fixed time to create a bang, but when you create it, mark my words, it will be the loudest!" Oh yes Pawana, your three books are surely the loudest bang for all your detractors in the past. And may you excel more with every passing year! My readers, if you too feel the same, do share her story and pour lots of love for Pawana in the comments below. Also, follow her at SHEROES. Absolutely commendable feat Pawana! More power to you! Thanks to everyone, and special thanks to team SHEROES Mahima maam Merrill maam . I wish best of everything darling.It's really a great feelings to be an author.Keep it up.